before we all disappear in a welter of mince pies and stuffing (or however you choose to celebrate Christmas/midwinter/festivals) just letting you all know that Nine Lives will be performing at the Arcola theatre in London for the WHOLE of January. We’d love to see you there. And if you’ve seen it already do tell EVERYONE you know in London to come see us. There are free tickets for refugees at every performance and free events with refugee and migrant artists on Saturday afternoons in association with Counterpoints Arts and Platforma. Have great holiday and see you at the Arcola in January. Nine Lives after a triumphant tour around the country is returning to Leeds for ONE NIGHT ONLY. On Tuesday 15 December we will be at Oxford Place Methodist centre opposite the Town Hall at 7.30pm for a special fundraising performance in aid of No Goin Back the LGBT Asylum Charity. The performance is FREE with all donations going straight to the charity. Come support! Or turn up on the night. See you there! We are delighted that Nine Lives in Doncaster will be joined by the brilliant Egyptian, and Doncaster based, musician – Mina Salama. 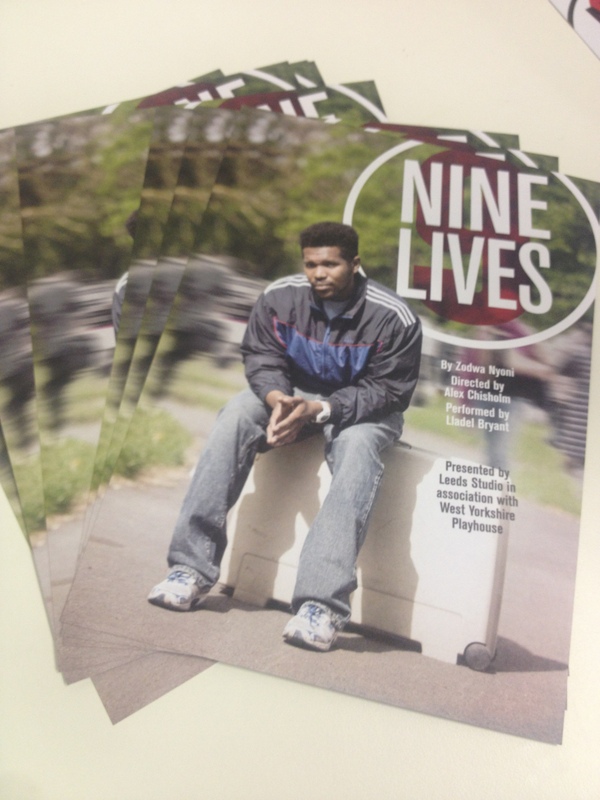 This will be in double-bill with the Nine Lives performance at Cast in Doncaster on Thursday 12 November, starting at 7.45pm and FREE to all attenders to the show. 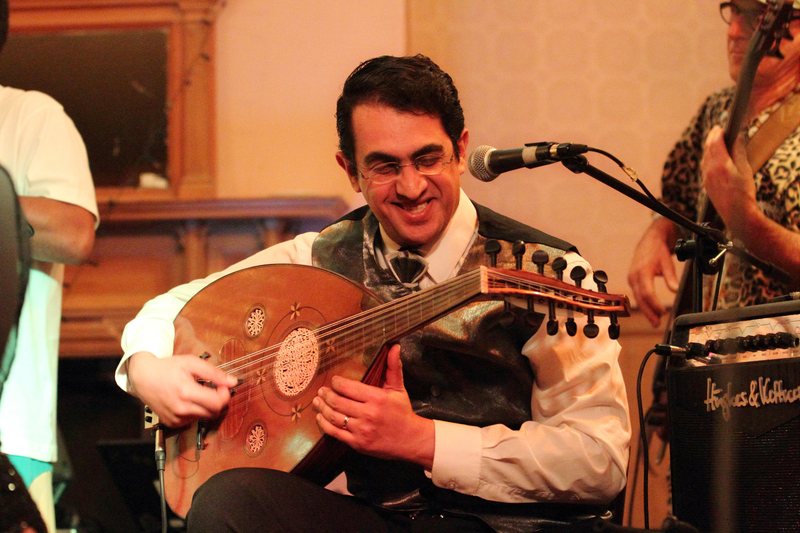 Immersed in Coptic liturgical, Arabic and European classical & filmscore music, and with a blossoming international career as a multi-instrumentalist with the Alexandria Opera House Orchestra, Mina improbably found himself seeking asylum here in 2012. To our delight he is now surfacing as a talented and in-demand musician with his virtuosity, drive and sensitivity leading to commissions & collaborations across our polyglot UK world music scene, including performing, composing and recording with MIRO Manchester International Roots Orchestra, Rafiki Jazz, with the Haymanot Tesfa Trio, and with Turkish live-artist Aysegul Balkose. Mina has performed at the Edinburgh Festival 2014, Celebrating Sanctuary Southbank 2013 & 2014, AHRC Connected Communities Festival Cardiff 2014, Journeys Festival 2014 Leicester, Manchester Bridgewater Hall 2013, Platforma Festival 2013, and is currently working on Haymanot Tesfa‘s solo recording project with Arian Sadr, on MIRO’s debut CD, and on Rafiki Jazz‘s 3rd album project. We are very, very excited to share with you that Nine Lives is being published by Methuen Drama along with Zodwa’s monologue Come To Where I’m From. 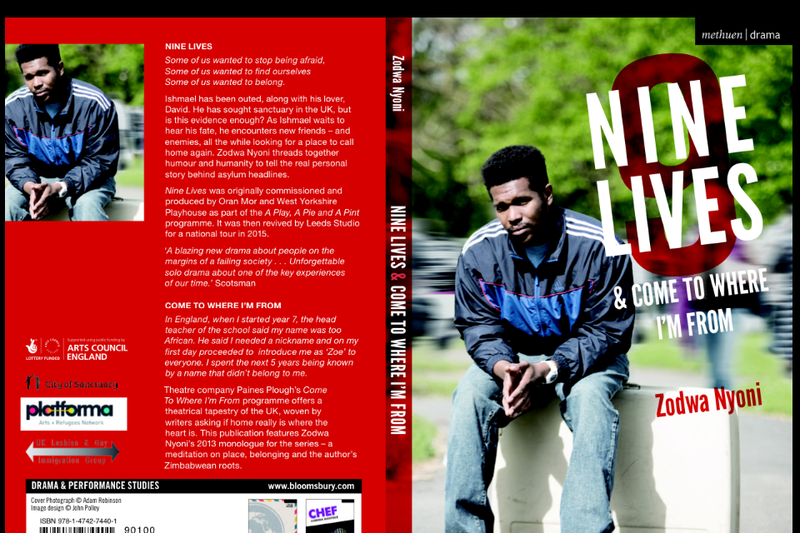 So now you will have the chance to take Nine Lives home with you, read it, cherish it. Full of brilliant monologues for men and women – for all those auditioning/showcasing actors among you. sorry it’s been a bit quiet here for a while. Been very busy taking Nine Lives out on the road (actually more out on the rail – this is a very public transport tour). Thank you to everyone who has made it already to see us – we’ve had fantastic time in Holbeck, Liverpool, Sheffield and Hebden Bridge. 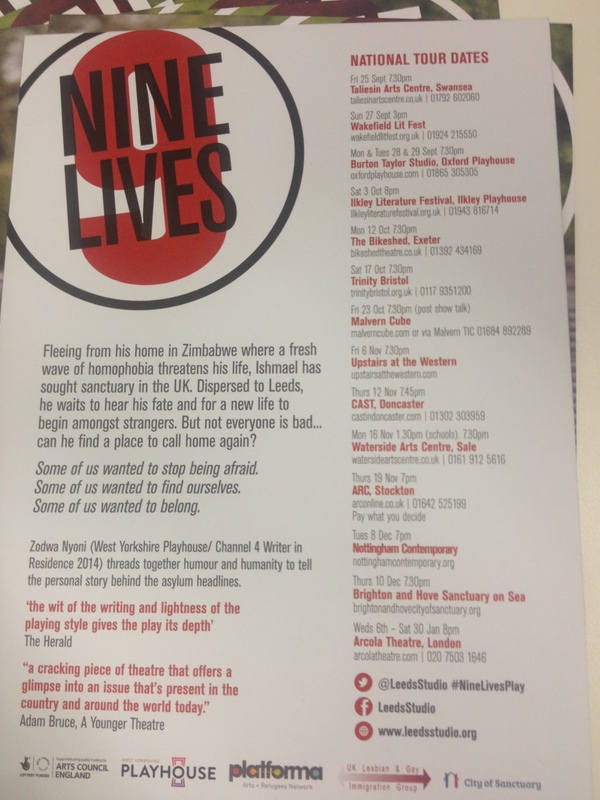 If you haven’t made it yet Nine Lives is COMING BACK TO LEEDS. This is the LAST Leeds date before we head off on a National Tour this Autumn (dates being announced SOON). wandering and searching for/finding your place. And just to tickle your fancy here are some of the things that people have been saying about the show. Enjoy! 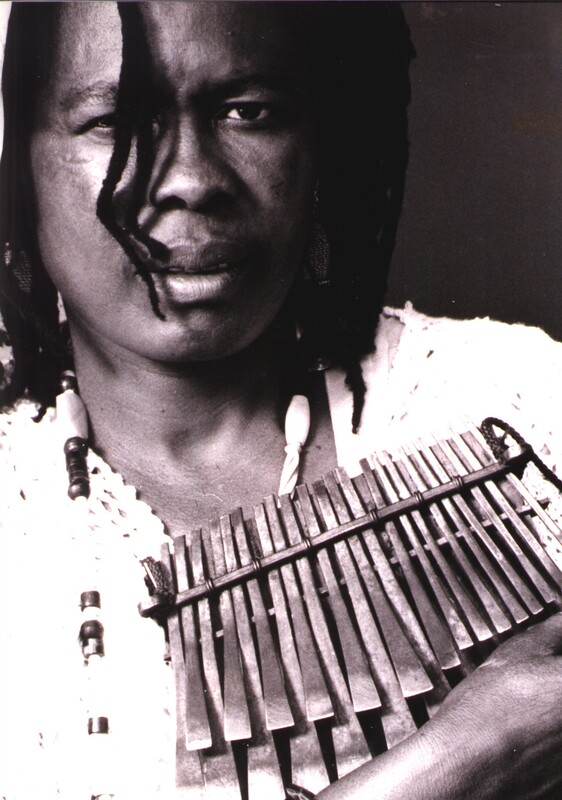 Calling out to all World Music fans in Leeds, renowned Zimbabwean musician, Stella Chiweshe, will be appearing in a rare and intimate solo gig, in a double bill with Nine Lives in Leeds. To celebrate Refugee Week 2015 and the opening of Nine Lives, Stella Chiweshe, will be playing after the first performance at The Hub, 5pm Sunday 21 June. The gig is only available in a double bill with Nine Lives. Tickets are Pay What You Decide and available from boxoffice@slunglow.org or on the door prior to 5pm on the day of performance. Despite having endured many trials and tribulations,respected veteran Zimbabwe-born singer and instrumentalist Stella Chiweshe has never lost faith in the healing power of music. Some artists project a stage persona which differs markedly from their everyday personality. Nothing could be further from the truth as far as Stella Chiweshe is concerned. The 68-year-old Shona singer and instrumentalist is the real deal. Her singing and mbira (mbira dzavadzimu to give it its full name) playing are not just a joy to behold, they generally leave her audiences spellbound and elated. Mbira dzavadzimu is a sacred instrument used by the Shona people of Zimbabwe to call on the spirits of their ancestors. Chiweshe set out on the global concert circuit in the early 1980s and has released seven albums under her name to date. She is a regular performer at the prestigious WOMAD world music festival, and has toured her inspirational music all over the world. Her endeavour and persistence has opened the door to other women to follow her musical, artistic and traditional social status-defying lead.